Our office employs advanced technologies available to ensure your comfort and the best results. Dr. Levin helped develop digital radiography, endodontic microscopy, computerized record keeping, new root canal filling materials and continues to serve as a consultant to several manufacturers. Our practice is the first endodontic specialty practice in the U.S. to employ this new high resolution radiographic technology. Our Carestream 9000 3D produces highly detailed three-dimensional digital radiographs of the jaws to image areas of interest with greatly reduced radiation when compared to medium and full field of view CBCT units. structures can make interpretation of these images difficult. Cone-beam computed tomography (CBCT), a variation of medical computed tomography systems (CT), uses an x-ray generator and detector that rotates around the patient to capture an undistorted 3D image. X-ray imaging, including CBCT, provides a fast, non-invasive way to visualize the teeth and maxillofacial skeleton. We only use CBCT to provide clinical information that cannot be obtained by other lower-dose imaging technologies. More information about the appropriate use of CBCT is available from the Joint Position Statement of the American Association of Endodontists and the American Academy of Oral and Maxillofacial Radiology Use of Cone-Beam Computed Tomography in Endodontics. We are pleased to discuss the benefits and risks of all x-ray exams with you and alternatives to the exam/s. We use radiation reduction techniques and subscribe to the size-based protocols for children advocated by the Image Gently Alliance. Please let us know if you have any questions. Specialized operating microscopes are used during all phases of your endodontic treatment. Magnification and fiber optic illumination enable us to see small – often missed – details such as calcified canals and fractures. Our new Kodak 9000 3D equipment has two sensors, one dedicated to producing CBCT images and a second for surveying the entire mouth in a very high resolution panoramic radiograph. These sensors offer the highest spatial resolution available, with special sharpness filters to optimize the image quality. The CS 6200 also provides increased flexibility for positioning, offering increased patient comfort. Our high-resolution, energy-efficient 24” LED backlit displays allow optimal viewing opportunities to detect problem areas. All radiographs are taken with digital sensors, providing instant viewing on our computer monitors while significantly reducing radiation levels compared to film-based x-rays. This technology also allows for secure electronic transfer of medical information to our patient’s co-therapists. 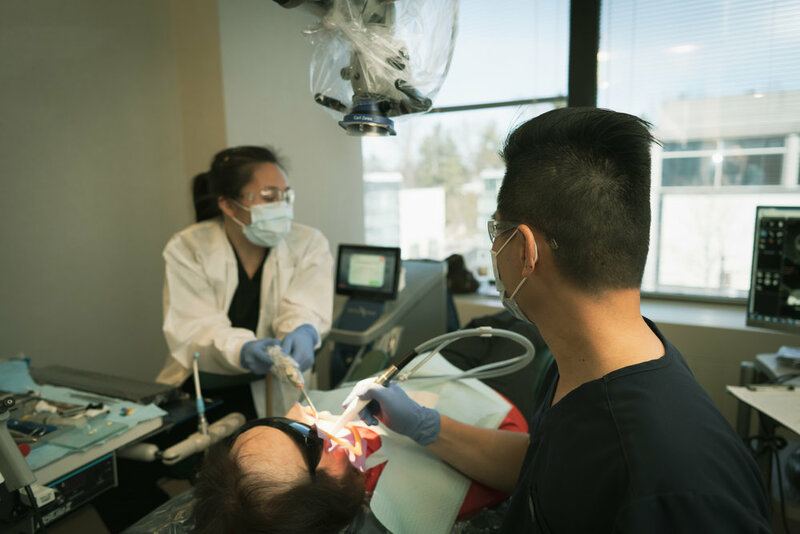 Your endodontic treatment records and radiographs are kept in our secure computer system for both instant retrieval and remote consultation.